Enemy at the Gates is a bit of a rarity – an American war movie that focuses on a decidedly non-American event in World War II, namely the siege of Stalingrad. Based ever so loosely on real events, the film tells of story of Vassili Zaitsev (Jude Law), a farm boy turned soldier who shoots several German officers and saves the life of a political officer in the process. This particular officer (Joseph Fiennes) sees in Zaitsev an opportunity to advance his own career, and so he pushes Zaitsev to the forefront of the Russian Army’s propaganda campaign... and also to the front of the sniper division. Zaitsev is so effective that Germany’s own ace sniper, Major Konig (Ed Harris), is dispatched to remove the threat. Thus begins the battle within the battle... one of wits, of skills, and of passions. Dreary, grimy and dirty, Enemy at the Gates paints its palette in drab grays and browns, highlighted by the occasional splash of red. As such, there’s not much in the way of color, but what’s here looks good. The movie is generally dark, lit by smoke-filtered sunlight and fires, and the HD transfer presents it well. This is an accurate transfer, but not a pretty one to be sure. The lossless TrueHD audio tightens up everything from the bass to the reports of the rifles. Surprisingly for a war movie, Gates was never much of a floor pounder outside of a few choice sequences. Accordingly, the surround mix works more to reinforce the quiet serenity this sniper must achieve to do his work, rather than knocking your socks off. No additional bonus materials are present here on Blu-ray Disc, but everything from the original DVD release is present, including a few deleted scenes, an EPK-style featurette and the film’s trailer (now upgraded to HD). 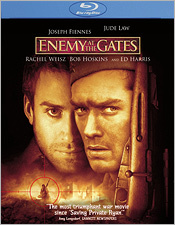 Enemy at the Gates is a flawed picture, and the love triangle (centered around Rachel Weisz) feels somewhat tacked on. Law, Harris and Bob Hoskins each turn in some great performances, though Weisz and Fiennes fall a bit flat. When it comes to the sniper action, however, this film is top notch. Vassili’s innocence and the cold viciousness of Konig – as well as the lengths to which the latter will go to bag the Russian hero – are what really make this picture memorable. Enemy at the Gates is not the best war movies ever made, but it’s among the more human.